In Japan, the summer months are known to be hot and humid, so it makes sense that there are many different dishes made to help keep you cool in the summer weather. 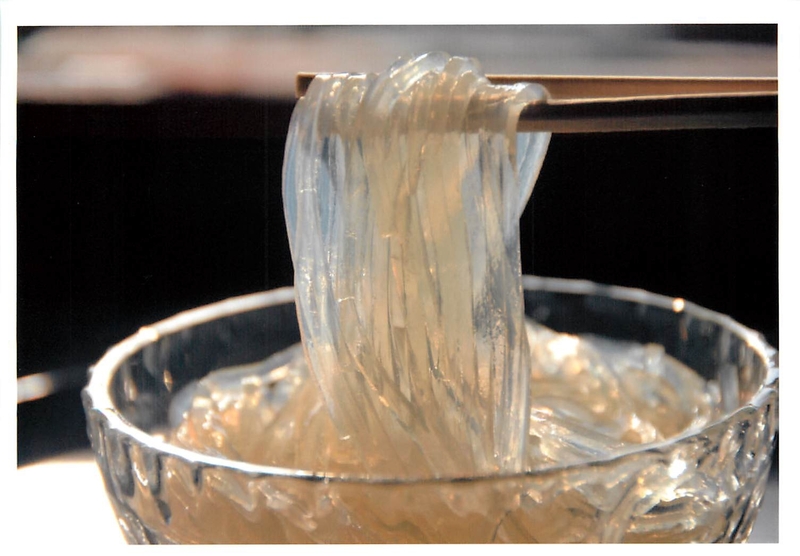 One such dish is known as tokoroten (ところてん), a noodle dish made of clear kanten jelly noodles with a crisp dressing. The dressing can be sweet but very often tokoroten is served with a sour and refreshing vinegar based dressing. Tokoroten is said to have come to Japan from China in the Nara period (710-794). 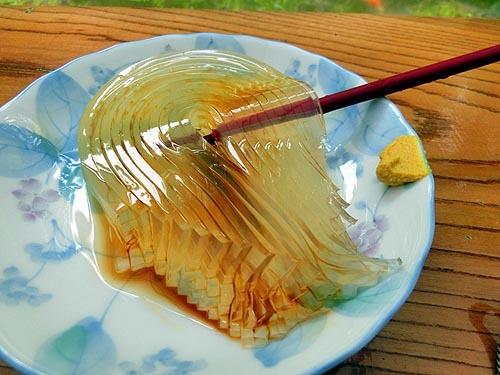 It’s made by creating a broth of tengusa (天草)–a light-as-air-seaweed whose name means “heavenly grass”–and allowing it to cool into a gelatinous solid block. 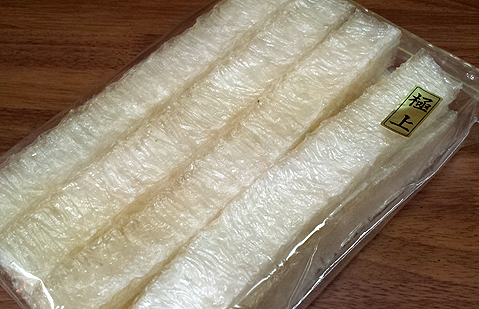 The block of tokoroten is then cut into noodle-like strips or pushed through a tentsuki (天突き). A tentsuki is a long wooden, metal, or plastic square with a grid on one end and an open space on the other. 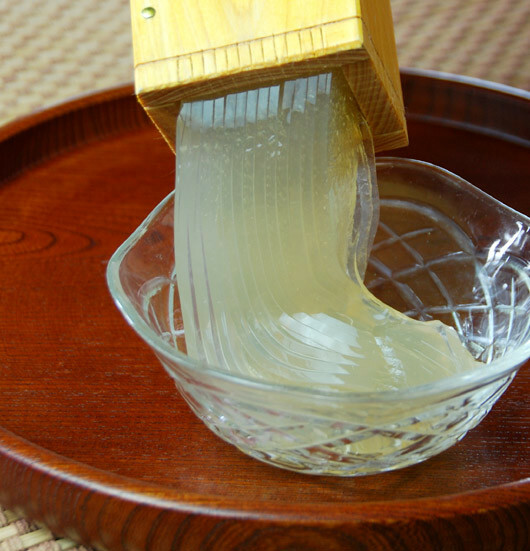 To cut tokoroten, the block of jelly is slid in through the open end, then pushed through with a flat board on the end of a stick; this makes the tokoroten squeeze between the grid and come out in perfect noodles. Tokoroten hasn’t lost any popularity since it first came to Japan. In fact, you can even find tokoroten-ya (ところてん屋): restaurants that specialize only in tokoroten! 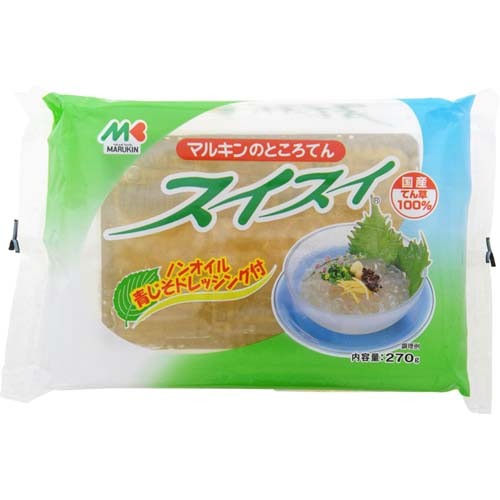 The block of tokoroten can go through a freeze-dry process in order to make kanten (寒天), a completely vegan jelly substitute that can be used in all kinds of sweets or to thicken liquids without having to use gelatin. It can be bought in block, stick, or powder form. Funnily enough, bo-kanten, which is the stick form, can also be rehydrated and used to easily make tokoroten at home. While tokoroten is believed to have come from China, the ability to freeze-dry tokoroten into kanten seems to be a purely Japanese discovery. The story goes that in the Edo period of Japan (1603-1868), there was either an inn owner or a samurai visiting an inn who had too much tokoroten. Whether it was the owner or a samurai, they left the remaining tokoroten outside in the cold, where it froze overnight then defrosted the next day and eventually dehydrated. 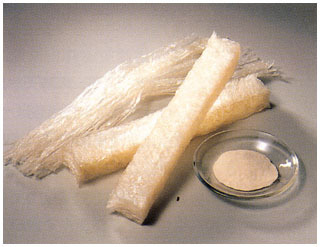 This process was developed further since this freeze-dried kanten was much easier to use, store, and transport than the original tengusa seaweed. But there’s more to tokoroten than just the noodles. As was mentioned in the beginning of the post, tokoroten comes served in a sauce that can be either vinegar based, or sweet and brown sugar based. Most of Japan uses either a 1:1 mix of rice vinegar and soy sauce or a mixture of rice vinegar, soy sauce, and dashi stock. However, if you go to the Kansai region of Japan you’ll find the sweet version made with brown sugar syrup and often served with fruits. That’s not the only regional difference when it comes to tokoroten: if you’re in the Tokai region you’re expected to eat your tokoroten with just one chopstick! If you want to try tokoroten at home, there are a few different paths for you to take. The easiest way would be to buy the packages of pre-made tokoroten. When you buy these, you’ll almost definitely be getting the vinegar version. If you want to try the sweet version or even make your own sauce, or if you just want that sense of satisfaction that comes from pushing a block of kanten through a tentsuki (which can be found for pretty cheap almost anywhere online), then you can buy a block of kanten and whatever you want to add to your sauce. You’ll want to make sure you get the block or stick version rather than a powered version, because that’s the best way to get the perfect tokoroten texture in the noodles. Then, if you want to be extremely authentic, you can always try to find tengusa online somewhere and do it like they did in the Edo period. If you’re wanting to make the sweet version all you need is a 3 ounces of dark brown sugar or kokuto, 3 ounces of granulated sugar and about half a cup of water. Just mix everything together then put it over low heat and stir until everything has formed a smooth syrup. You can even add some mochi, sweet red beans, or fruits to your sweet tokoroten. Whether you want to buy some premade tokoroten, make your own from kanten, or even just grab some kanten to use as a gelatin substitute, you can get everything you need right here at Asahi Imports! So do you prefer sweet or sour tokoroten? Or do you have an entirely different food to beat the summer heat? Let us know in the comments below! Maybe you’ll see a future blog about your favorite Japanese treat to beat the heat! I’m glad that we helped introduce you to this perfect summertime snack. I hope you can pick some up or try your hand at making the sweet version. Let us know how it turns out if you do!